By the time you are finished reading this article, you will have no doubt in your mind that the Zimbabwe dollar is a horrible investment. In this video, I explain that the Reserve Bank of Zimbabwe (RBZ) has announced that the largest denomination note, the 100 Trillion Zimbabwe Dollars Note, is going to be exchanged at a rate of just 40 cents. Many investors have paid as much as $40 for these worthless notes. This article was originally published back on April 16, 2014 and I have not had to make any changes to it. Zimbabwe dollar USD conversion is something that you are probably looking for. ZWD to USD Exchange Rate is another phrase you could be seeking. 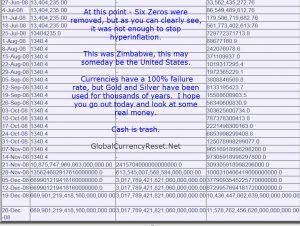 I have good news for you, since this site is about the global currency reset I must include the Zim dollar since many of you are confused. First off, I do not have any Zimbabwe Currency for Sale so please don’t contact me about this. The fact of the matter is simple: the Zimbabwe dollar is no longer being used in Zimbabwe, it’s worthless. 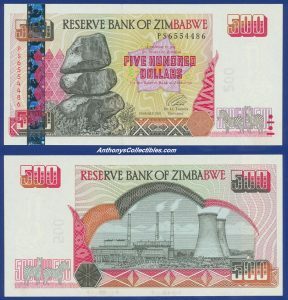 On February 2, 2009 the Reserve Bank of Zimbabwe (RBZ) removed (lobbed off) twelve zeros from the Zimbabwean Dollars. 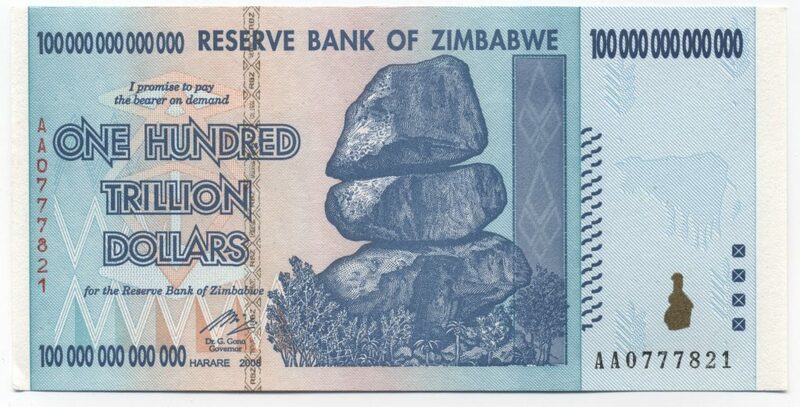 So if you can visualize it, 1,000,000,000,000 Zimbabwe Dollars becomes just one dollar, pretty simple right? Trying to figure out 1 USD to Zimbabwe dollar is a waste of time since the currency is not being used. USD to Zimbabwe Dollar is what you should be looking for, however, the exchange rate is misleading since the currency has not been used in financial settlements since 2009. There are multiple people buying Zimbabwe Dollars, I do not recommend you buy any, the currency is not even worth the paper it’s written on. People might be searching for Zim dollar to USD converter but they will be looking for a long time. iv. Inadequate and often erratic service delivery from parastatals and local authorities. 5. These challenges have resulted in low industrial capacity utilization, accentuated by widespread company closures, deterioration in the external sector position, and rising formal unemployment. 12. Against the background of the limited role played by the Reserve Bank since the introduction of the multiple currency system, the Honourable Minister of Finance and Economic Development, in his 2014 National Budget instituted bold measures to restore the role of the Central Bank. 13. The Central Bank applauds these bold strides aimed at situating the Reserve Bank in its rightful position as an important institution in the financial sector and the economy at large. Within the context of the multiple currency system, the development of domestic financial markets remains intricately bound to external sector developments. This is particularly so as balance of payments developments have a direct bearing on liquidity conditions in the domestic economy. 112. The Zimbabwean economy has increasingly become a cash economy in spite of the Reserve Bank’s efforts aimed at promoting electronic means of payment. There is a notable rise in the propensity by many formal and informal corporates as well as individuals to settle transactions in cash. The increased use of cash has seen numerous incidences of fake currencies being injected into the economy, particularly during the 2013 festive season. 115. Within this context, we urge all key stakeholders including the banking sector, payment systems providers and businesses to partner with a view to acquiring adequate Point of Sale (POS) machines to facilitate the wider spread of the gadgets. 116. Against this background, the banking sector is, therefore, urged to ensure that all clients be issued with bank cards and adopt strategies to encourage wide use of the same. 126. Prior to 2006, gold produced by both small scale and large scale miners exceeded 15 tonnes. During this time, Fidelity Printers and Refiners was the sole buyer and refiner of gold and an accredited member of the London Bullion Marketers Association (LBMA). This was largely so, as the gold output realized by the country, exceeded the 10 tonnes annual threshold required to maintain membership with the London Bullion Metal Exchange. 127. Under this arrangement, gold produced and refined in the country was directly exported at the international gold prices obtaining at the LBMA, without any middlemen or intermediary. 128. This notwithstanding, gold output declined to levels below 10 tonnes in 2007, on the back of the general contraction in economic activity. As such, Zimbabwe could not maintain its position as a member of the LBMA, thereby we have been exporting gold through South Africa for refining. 139. In the wake of the takeover of the Reserve Bank debt by Government, amounts owing to creditors will be settled from the fiscus. In the same vein, holders of gold bonds previously issued by the Reserve Bank will also be catered for by Government. 154. Trade and investment ties between Zimbabwe, China, India, Japan and Australia have grown appreciably. 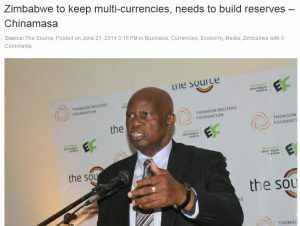 It is against this background of growth in trade and investment ties that in the 2014 National Budget, the Honourable Minister of Finance and Economic Development underscored the importance of including other currencies in the basket of already circulating currencies. 155. In this regard, we wish to advise exporters and the general transacting public that in addition to opening of accounts denominated in Botswana Pula, British Sterling Pound, Euro, South African Rand, United States Dollar, individuals and corporates can also open accounts denominated in the Australian Dollar (AUD), Chinese Yuan (CYN), Indian Rupee (INR) and Japanese Yen (JPY). As such, it is my fervent hope that the economic recovery prospects for Zimbabwe remains bright if the country’s export and growth potential is unlocked through the effective implementation of bold policy measures embodied in Zim-Asset. Convert Zimbabwe Dollars to USD is a way to compare the cost of one (1) Zim dollar to United States dollars. Here is the latest update directly from the RBZ: MONETARY DEVELOPMENTS The sluggish performance of the economy continued to hamper robust growths rates in the broad money. The main sources of liquidity under the multicurrency system are exports, external lines of credit and Diaspora remittances, given that the Central Bank cannot inject liquidity into the economy. These have not managed to generate enough liquidity to support economic activity and achieve desirable levels of money supply growth. (Source: MONTHLY ECONOMIC REVIEW Reserve Bank of Zimbabwe February 2014). 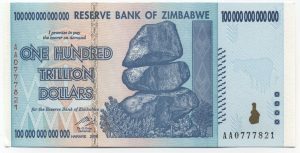 At the bottom of this article you will find a picture of a worthless 100 Trillion Zimbabwe Dollars banknote. Please get rid of your Zim dollars if you have any while you still can. I will be posting a video shortly related to this article. Zimbabwe Dollar To USD was the title given to this article because it matched what everyone was searching for. Hopefully now you all understand why I will not recommend buying Zimbabwe Dollars. I’m just trying to help all of us. 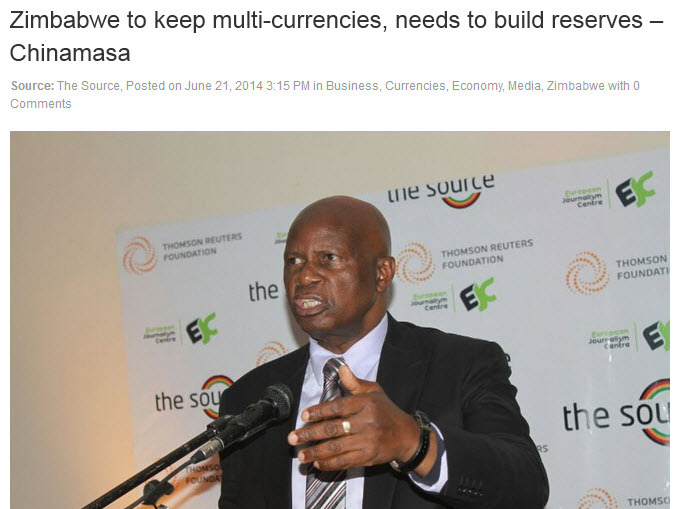 Don’t worry anymore about trying to research Zimbabwe Dollar To United States Dollar. I hold the Iqd, vnd, Idr, zims, was really hoping the zims would have been in the basket, after reading this it looks like there&apos;s not a chance for the zims to do anything, heck, 1 cent would have been great if they just removed 6 zeros, but, are you saying that they have already removed 12 zeros? Anyway, I really like your website, podcast, YouTube, very good info that you are giving to all the viewers, thanks for all the hard work that you put in for all of us, keep up the great work! 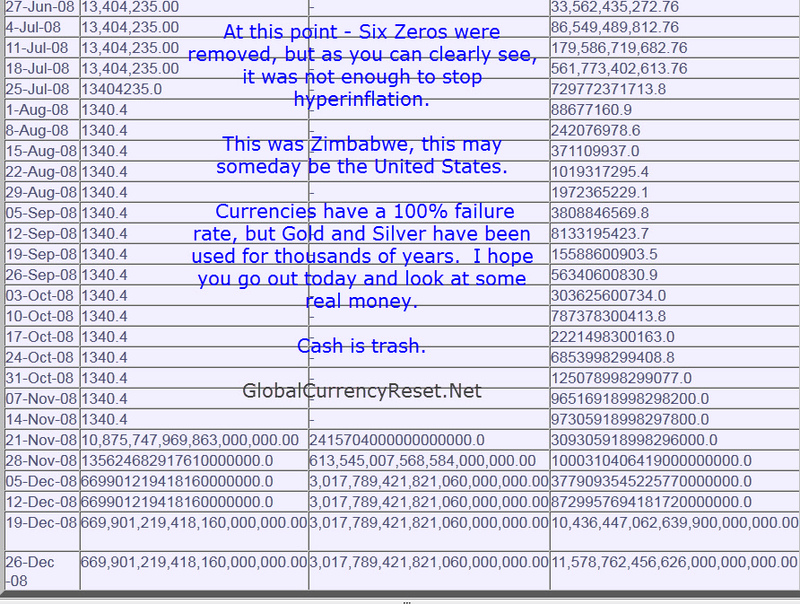 Thanks Adam, yes, unfortunately the zeros were already removed from the Zimbabwe Dollars back in 2009. Check wikipedia for more information. I don&apos;t quite understand where all the money is coming from for the exchange, is there a chance some people will be turned away at the banks? Thx. Sure, the banks could run out of physical cash and you have only digital currency to deal with, that is possible. Is it possible for zim to revalue? Cause I’ve heard rumors that it is. What’s the chances that it will? How can a currency revalue that doesn’t exist? It’s not used anymore, just call Zimbabwe, they use it as wallpaper. $0.11 maybe? 100 000 000 000 000= 100 000 000 x0.11= ?